I finally had the opportunity to serve my country, Maynmar, in its development using the knowledge and experience I had gained in Japan. I was born in Yangon, Myanmar. 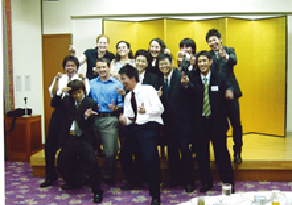 I came to Japan as a recipient of the Japanese Government Scholarship in September of 1994. After being enrolled in a Japanese language school in Tokyo, I transferred to Hiroshima’s National Institute of Technology Kure College in April of 1995. 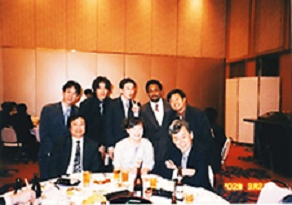 In April of 1998, I transferred to Hiroshima University’s faculty of engineering (department of architecture) and proceeded onto post-graduate studies at the same university. In 2005, I completed his doctor’s degree in engineering, and in April of the same year, I found employment at an architectural consulting firm. Since then, I have mainly been working on ODA projects to enhance infrastructure in developing countries such as my home country, Myanmar. I have traveled to countries such as the United States, Taiwan, China, Thailand, and Hong Kong, and I have taken part in international civil engineering conferences to present on the efforts of my research. As one of the leading members of the “HU Myanmar Student Alumni Association” at the time of its founding, I was inaugurated as its executive director in March of 2014. I decided to study abroad after graduating from high school. At that time, everything from cars, electricity, to electric appliances in Myanmar were mostly imported from Japan, and I had been fascinated by Japan’s remarkable technological capabilities since childhood. It perplexed me that Myanmar, a country rich in natural resources, was quite far from the prosperity of Japan, a country with technology but lacking in natural resources. Another one of the contributing factors to my burgeoning interest in Japanese language and culture was when I came into contact with a Japanese youth memorial association through volunteer activities during high school, and when I made Japanese pen-pal friends (during an era when the internet did not exist, I often made friends via writing letters). During the time when I was graduating from high school, the government was unstable, and universities were either facing closure or reopening their campuses in a cycle that gave young people such as myself great reason to be concerned about the fate of higher education. It was at this point that I began to consider studying abroad. It is typical for students from Myanmar to study abroad in an English-speaking country, but I felt that going to a technologically sophisticated country such as Japan would be of help to the development of my home country. With that, I decided to study abroad in Japan. 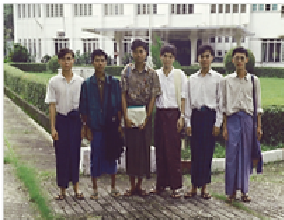 It was the year 1993 when I began preparing to go to Japan to study abroad, and, at that time in Myanmar, Japanese language was not undergoing the same “boom” that it is nowadays nor was it readily available for study at the local language schools. My knowledge was limited to the few references I had found after searching desperately throughout new and used book stores and to what I had learned by attending a Japanese class in my neighborhood. I was a beginner; I had learned only the basics such as hiragana, katakana, and perhaps a few kanji. However, after being enrolled at the Tokyo Japanese Language Education Center and undergoing intense language studies as well as experiencing the system of Japanese language education at the university level, it was by my second year in Japan that I had passed the N1 (most advanced) level of the Japanese Language Proficiency Test. I do not recall having any special methods for studying; I just worked diligently away at my studies and actively made Japanese friends to increase my opportunities to use the language. At that time, to study abroad in Japan was not an easy task. There was no such thing as the internet, and there was hardly any information on Japanese education in Myanmar. Moreover, Myanmar had all the while been a socialist country right up until that point; it had also been a closed country and a country with little information on overseas affairs. I had to go to great efforts to collect information on studying abroad. By chance, I had found out about the Japanese Government Scholarship and its recruitment of foreign students and applied immediately. I sat in for the examination at the Japanese Embassy in Yangon, and because the scholarship was limited to only one scholar I was ecstatic to learn that I had passed the examination and could realize my dream of studying in Japan. My initial intention was to study electrical engineering, but I decided to change to major to civil engineering after considering that Myanmar, a developing country, would need civil engineers for infrastructure development and public works. I departed from Myanmar on September 29, 1994. Students from several countries gathered together at the airport in Bangkok (at the time called Don Mueang Airport) and from there departed for Japan. We were greeted by authorities from the Japanese government at Narita Airport, and then sent to a dormitory in Komaba near the University of Tokyo on a chartered bus. There were approximately 60 of us, from different countries studying under the same program, who stayed together in the dormitory. I was overwhelmed by the cities of Japan. The infrastructure development was totally different from that of Myanmar. I was repeatedly amazed, starting from when I had my first encounter with a vending machine to when I bought my train ticket via a machine. I was startled to find that vending machines could serve cup noodles, hot and ready-to-eat, in just a matter of seconds. I remember heaving a sigh. How many years would it take for my country to achieve the same level of technology? Three months after I arrived in Japan, the Great Hanshin Earthquake occurred. Everybody in my class was stunned, watching the TV and seeing the fires triggered by the quake, the collapsed expressways, the damaged buildings, etc. That was my first time experiencing an earthquake. Talking about first experiences, snow was a first for me too. That day in Tokyo, when the first snowfall came, many foreign students ran out of the dormitory, threw snowballs at one another, and ran around enjoying this winter experience. This is still quite a fond memory of mine. During my six months in Tokyo until March 1995, I studied mainly Japanese language, and attended preparatory courses in mathematics, physics, etc. The Tokyo Japanese Language Education Center is a school with history and is distinguished for its Japanese language education. For half a year, I remember undergoing intense language training and preparatory course studies and spending all day every day studying. The reason was that we had entrance examinations coming up six months later, which we had to pass in order to move on to graduate school. Just when I had gotten accustomed to my life in Tokyo, I had to bid farewell to my international classmates and friends that I had grown to know well. At the end of March in 1995, I moved to Hiroshima with sorrow but also high expectations. There were three of us, including myself, coming to Hiroshima as part of the same program, one from Malaysia and one from Cambodia. We flew to Hiroshima from Haneda Airport, which was our first domestic flight in Japan. We were on our own, and we were anxious but relieved when we met the lecturer from our school who had come to meet us at Hiroshima Airport. We were admitted as third year students in the National Institute of Technology Kure College. I studied civil engineering, and the other two mechanical engineering and architecture respectively. After studying for three years at the National Institute of Technology Kure College, I transferred to the third year of the Faculty of Engineering at Hiroshima University. I continued to the master’s program and PhD program, and studied for a total of seven years at Hiroshima University. Since I had the opportunity to study abroad, I thought that I would at the most get a master’s degree, but I never imagined myself completing my PhD. But once I started conducting my research, my desire grew and I started to feel the urge to achieve the highest level of academic achievement: the PhD. I was the only student from the National Institute of Technology Kure College to transfer to Hiroshima University. Usually, only one student from one department of a college is allowed to transfer to one university. 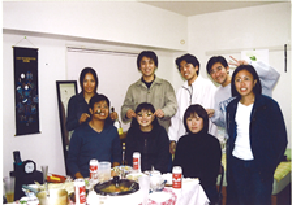 But when I transferred to Hiroshima University, there were a number of Japanese students who were transferring there at the same time, so we ended up going together. Some of my credits for the liberal arts courses I had taken at Kure College were recognized whereas some were not. So for those not recognized, I had to retake the subjects. That first year at Hiroshima University, therefore, was quite a busy one. Things became slightly easier when I became a fourth year, but soon enough we were assigned to different labs to start researching for our own theses. And once again, the busy days commenced. Considering that civil engineering structures are built on solid ground, and that geotechnical engineers are essential for infrastructure development, I chose to enter Professor Sasaki’s lab and conduct research on geotechnical engineering. After having entered the lab, in June of 1999, a massive landslide occurred in Hiroshima, and a large number of people were injured and some lost their lives. A landslide also occurred at Gagara-yama near Hiroshima University, and it was so powerful that the students’ cars that had been parked in front of the nearby dormitory were carried away. I went to the site as a member of the investigation team from my lab. I then decided to do research on natural disaster mitigation and how to save lives and properties by improving outbreak mechanisms that gauge when and where natural disasters will occur. That year, my thesis was chosen for the Best Thesis Award for the Civil Engineering at the university. I remained in the same lab throughout my master’s and PhD programs. As new students joined the lab, I remember helping them while simultaneously being helped by my seniors and professors. Research was time consuming, and, at times, quite tough. However, being chosen as the Best Presenter in the Japan Society of Civil Engineers (Chugoku regional branch office) and being chosen for the Best Master’s Thesis Award for the Department of Civil and Environmental Engineering helped me to feel that my hard work had paid off. As I love cooking, I would sometimes invite my lab mates to my house and treat them with some Myanmar cuisine. I remember playing pranks on them by drawing funny things on their faces when they were drunk and passed out. These are fond memories of my truly unforgettable days as a student. And although I am still as fond of cooking now as I was then, I have less time to cook. However, on occasion, I still try to invite friends over to my house and cook for them. I have an infinite number of memorable moments during my life in Japan. Although there are many similarities between Myanmar and Japan, I feel that there are also many differences such as culture, religion and spirituality, and eating habits just to name a few. From New Year celebrations, to sakura-viewing, to gift giving, there are many cultural practices in Japan that do not exist in Myanmar. In terms of cuisine, the Japanese method of using soy sauce or miso as a base for cooking is very different from Myanmar’s use of nam plaa (fish sauce) and spice. I remember when I first came to Japan and was just beginning to study Japanese, we had a class on ingredients used in Japanese cuisine. The teacher had decided to introduce natto to us. With its peculiar smell and its odd stickiness, many of the students ran right out of the classroom upon seeing (and smelling) it for the first time. Besides culture and cuisine, there are countless other examples of memorable moments that I have had in Japan. Boarding a shinkansen for the first time, touring the famous bridges of the Seto Islands, going to an amusement park, staying at a Japanese friend’s house overnight, participating in a 24-hour fund raising event broadcasted on TV, going skiing for the first time – there are too many memories to name them all. And speaking of this last memory, I had gone skiing with friends from school, some of whom were also beginners, but I remember being the only one that could not seem to get the hang of it. 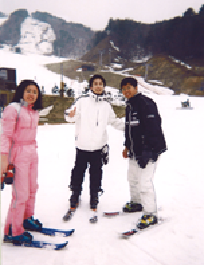 I believe it took me the longest of all the international students who had come that day to learn how to ski properly. After the Great Hanshin Earthquake that occurred six months after I had come to Japan, the 2000 Tottori earthquake also occurred, which was then followed by the 2002 Geiyo Earthquake as well as continuous volcanic eruptions. And recently, in 2014, Hiroshima Prefecture was struck by a series of landslides. I am really alarmed to see how often Japan faces natural disasters. And it is very impressive that Japan continues to improve its level of construction technology and urban infrastructure after each incident. Preparing for the employment examination was another moment that I remember really well. It is quite difficult for a foreigner to work in the civil engineering field in Japan, especially after the collapse of the “bubble economy” when the construction industry had fallen into a slump. But more than anything, I think the largest barrier for foreigners seeking employment in the civil engineering field in Japan is language, and also the employment examination. I remember spending long hours in preparation for that exam. After graduating from university, I started working at a major Japanese architectural consulting firm. This firm works on a number of projects to support the development of countries mainly in Asia but also in more than 60 countries around Africa, the Middle East, Latin America, etc. It also handles many infrastructure development projects in my own country, Myanmar. The firm’s first overseas project was building a hydroelectric power plant in Myanmar, and I remember reading an article about that project in a school textbook that I had used when I was a junior high school student in Myanmar. I remember learning about it in school and it had become one of my biggest motivations to join this firm. I had a strong feeling that my country would be in need of civil engineers for the development of infrastructure and public works one day, and so I majored in civil engineering and gained experience in this field. For my first seven years at the firm, I worked on the social infrastructure construction sites of the Ministry of Land, Infrastructure, Transport and Tourism in Japan. 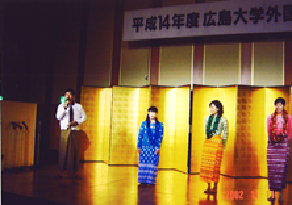 Four years ago, in 2012, I was transferred to the Overseas Division and was assigned to development projects and social infrastructure projects implemented by the ODA of the Japanese government in developing countries, focusing mainly in and around Myanmar. The opening of Myanmar to the world took some time due to political turmoil, but I finally had the opportunity to contribute to the development of infrastructure and public works in Myanmar beginning four years ago. Thanks to the projects overseen by JICA, the Ministry of Land, Infrastructure, Transport and Tourism, the Ministry of Economy, Trade and Industry, and others, I not only had the chance to get involved with projects in urban areas but also projects in rural areas inhabited by ethnic minorities. I finally had the opportunity to serve my country, Myanmar, in its development using the knowledge and experience I had gained in Japan. This year, I am in charge of the development project of the ODA of the Japanese government in Vietnam, and for the next three years I will mainly be working on such projects around Vietnam but will also be involved in similar projects in various countries.